When Ferrari announced it was naming its Formula 1 car the "F150," in honor of Italy's sesquicentennial, many people immediately wondered why Ferrari would step on Ford's most successful truck of all time. Turns out Ford's wondering as well; as first reported by PickupTrucks.com, it's now taking Ferrari to court over the choice. F-150 is an established and important Ford trademark and the name of the best-seller in Ford's F-Series, America's best-selling trucks for 34 years and best-selling vehicles for 29 years. 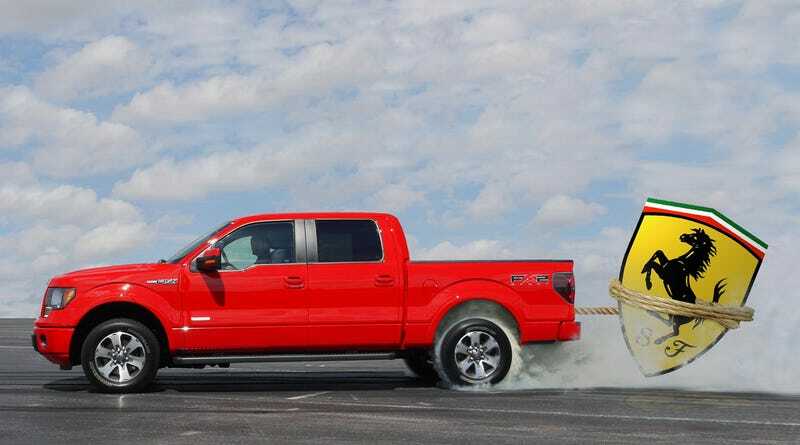 Through extensive sales and advertising and exclusive use, Ford has earned invaluable goodwill in the F-150 trademark. That hard-won goodwill is seriously threatened by Ferrari's adoption of "F150." When Ferrari announced the name of its race car as "F150," Ford asked Ferrari to change the name. Ferrari did not respond in a timely manner, leaving Ford no choice but to take legal action to protect its important brand and trademark rights. They could always race for it.